In a few dozen mutations spanning five generations of computers, which started in 1939 with the ABC (Atanasoff-Berry-Computer) and extended to today’s petaflop supercomputers, the computational power of digital computers has skyrocketed from a mere (!) few hundred FLOPS (Floating Point Operations Per Second), a measure of a computer’s performance, shooting through the computational thermosphere at petaflop speeds (million billion FLOPS). ENIAC, the grotesque energy monster. Now a museum piece, the world’s first programmable computer, Electronic Numerical Integrator and Computer (ENIAC), operated at 500 flops. The twenty-seven-ton monstrosity consisted of thirty separate subunits with 19,000 vacuum tubes, 1,500 relays, about one hundred thousand resistors, capacitors, crystal diodes and inductors and occupied 63 square meters of floor space. A 175kW power supply, which needed repairs on average every 5.6 hours, was used for feeding and forced cooling the voracious electronic dinosaur. ENIAC operated at a computational speed of 0.0029 FLOPS/Watt. 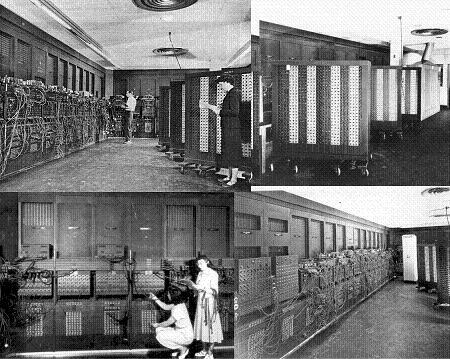 Despite what is now a laboriously slow operating speed, ENIAC was the fastest supercomputer of the time and condemned its contemporary mechanical relay computers, operating at Bell Laboratories and elsewhere, to the dustbin of history because they operated two orders of magnitude slower. The latest supercomputers operate in the petaflop territory producing about 36giggaflops for each Watt of electricity they consume, an astounding enhancement in the computational power, rated about 13trillion times greater than ENIAC. If it were physically possible to enlarge ENIAC, enabling it to operate at petaflop speeds, it would require 348 petawatts (3.48E+17W) of electricity, or 175,000 times more electricity than is generated globally [c.f., the luminosity of Sun is 3.846E+26W.] In other words, the combined electrical output of 175,000 earthlike planets would be needed to operate the hypothetical ‘super-ENIAC’ at the current computational speeds. The first order constraint in the evolution of artificial ‘intelligence’ is the computational power efficiency (FLOPS/Watt, or MIPS/Watt), or simply the ‘energy footprint.’ Architectures that fail to overcome the constraint are committed to extinction. Unable to evolve, ENIAC became extinct. It could never have survived, other than as a museum piece, because of the following reasons. 1. Its computational power efficiency was outdone by faster computers. 2. If ENIAC were to be upgraded operating at improved speeds, it would have required too much power. Its energy demands on the operating environment would have been unsustainable. Instead, the operating environment, the larger system with which ENIAC interacted, literally pulled the plug on the grotesque monster, withdrawing its life support. First law of evolution of artificial intelligence: To continue evolving, each successive generation of computers must improve its computational power efficiency (FLOPS/Watt, or MIPS/Watt), subject to the ultimate physical limitations. Second law of evolution of artificial intelligence: Architectures whose growth or extensions would impose exceptional demands on energy resources become unsustainable and are committed to extinction. What about humans? Has human intelligence evolved? Are they more intelligent now than before? Do they consume more, or less power than the previous generations? Has the human ‘computational power efficiency’ improved? To be “targeted for selection,” humans and therefore their intelligence must continuously evolve. Human intelligence cannot evolve, unless the following conditions are satisfied. A. The current generation must be able to perform the same or greater number of functions for less energy (operate more intelligently) compared with previous generations. In other words, each generation must achieve higher rates of computational power efficiency successively—do more with less, every time! To test the above conditions, the current generation’s energy profile is compared with the previous generations’ consumption data. The world per capita energy consumption has risen from about 818W in 1800 to 2,435W in 2006, a 3-fold rise. The United States per capita consumption rose to 13,372W, in the same period. Based on the evidence, the per capita human energy consumption has not decreased; therefore, the evolution of human intelligence must have stalled. In fact, it can be said that the opposite of evolution is occurring because human demands on energy is much greater now than before. Of course, it could be argued that humans now operate at higher “computational speeds.” But that is exactly the point. Like the hypothetical super-ENIAC, human technological savvy is being achieved by growing bigger, not through improved power efficiency. The rate of evolution of human intelligence, and therefore the human species, is regressing compared with the pre-industrial era. Like ENIAC, humans have degenerated into energy dinosaurs! Let us further examine the above findings against an observation of the state of the environment, whose unintrrupted support is vital to human survival. To guarantee their survival on long-term basis, humans must exponentially decrease their energy and material demands on the environment. But is that the case? Again, the evidence suggests the opposite to be true. Human consumption is on the exponential rise and, increasingly, the environment is failing to provide support. In 2006 global energy consumption reached a staggering total of 507EJ [one exajoule, EJ, is 10 exponential 18 joules, 10^18J] equivalent to the energy released by detonating 25,437 Hiroshima-sized A-bombs each day, 9.3 million bombs throughout the year, or one A-bomb for every 700 people on the planet.] With more than two thirds of the ecosystems driven to the verge of imminent collapse as a result of intense human activity, which demands excessive energy consumption, it would only be a matter of time before total environmental collapse occurs committing the energy dinosaurs and thousands of other species to extinction. The key to preventing the next mass species extinction and preserving human cultures is one of creating the opportunity for humans to evolve at very low rates of energy (and material) consumption. In 2005 the Management School of Restorative Business (MSRB) reported its findings concerning the ‘safe’ level of global energy consumption. It was determined that to minimize the environmental devastation wreaked by excessive energy consumption, humans must reduce their total energy consumption to about 60EJ/year, immediately (this level is equal to about 11.9 percent of global energy consumption in 2006). There are a number of forced factors why instead of evolving human intelligence has regressed causing humans to degenerate into grotesque energy monsters. The main reason for the regression is the monetary gains made by the world’s overlords, whose perceived interests are served when more (NOT LESS) energy and materials are consumed. Their interests clearly fly in the face of human survival. MSRB and its affiliates at Creating A Sustainable Future, CASF, are conducting ongoing research preparing blueprints for what are believed to be sustainable communities whose per capita energy consumption falls below 286 Watts. This figure is computed when the safe energy consumption ceiling of 60EJ is divided equally among the projected world population ( late 2007 – early 2008 ) of 6.65 billion souls (a full definition for Pioneer Clusters Intelligent Communities 286W would be available soon at the URL: https://edro.wordpress.com/energy/286w/). In ordinary times, the freshman naïveté would be regarded as an asset.